In 1935 the U.S. Navy placed an order with the Grumman Aircraft Engineering Corporation, then of Farmingdale, for the design and construction of a new fighter, the F3F. 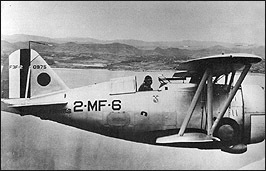 Based on earlier Grumman biplane designs, the F3F was faster and more maneuverable than any Navy fighter to date. By 1937, due to the slow development of the early monoplane fighters, the Navy ordered more F3Fs, this time an improved model, the F3F-2. The F3F-2 was strong, fast, maneuverable, and was considered a wonderful aircraft to fly. Its pilots considered it the ultimate biplane fighter; in fact it was the last biplane fighter produced in the United States. With its silver fuselage, yellow wings, and red, white, and blue markings, it was among the most colorful military aircraft ever built, but it heralded the end of an era. By 1939 all U.S. Navy and Marine fighter squadrons flew Grumman biplane fighters exclusively. Of the 164 F3Fs built, 140 were still in service, as trainers in United States, at the time of the U.S. entry into World War II in December, 1941. Today the F3F is an extremely rare aircraft, with but two original surviving examples. The aircraft is an accurate full-scale interactive replica of the F3F, built by museum volunteers working from blueprints.